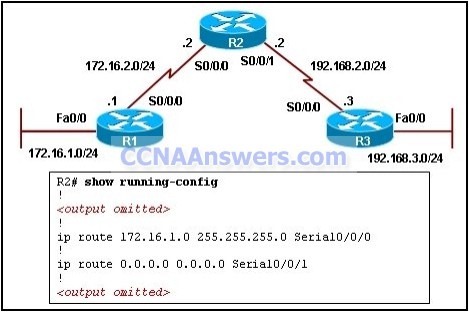 Packet Tracer Help CCNA Packet Tracer Help. 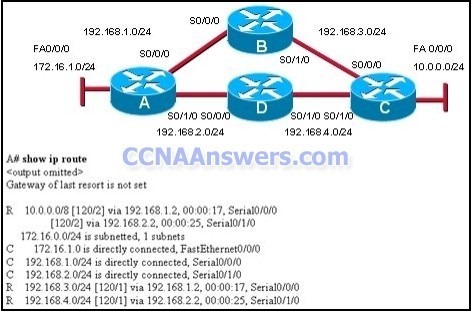 CCNA Exam Answers, CCNA Final Exam Answers, CCNA Module Answers, CCNA Chapter Answers, CCNA Test Answers, CCNA Questions and Answers, CCNA 1 Answers, CCNA 2 Answers, CCNA 3 Answers, CCNA 4 Answers, CCNA v4 Answers, cisco.netacad.net, Packet Tracer Activities & Labs, GNS3. CCNA Packet Tracer Help. Routers that run a link-state protocol can establish a complete topology of the network. Routers in a multipoint network that run a link-state protocol can exchange routing tables. Routers use only hop count for routing decisions. The shortest path first algorithm is used. Split horizon is used to avoid routing loops. Refer to the exhibit. RouterA and RouterB cannot successfully exchange EIGRP routes. What is the problem? The hello intervals do not match. The autonomous system numbers do not match. The no auto-summary command is missing from both routers. The ip bandwidth-percent command is missing from RouterB. Refer to the exhibit. Based on the partial output in the exhibit, why can users establish a console connection to this router without entering a password? The login command was not entered on the console line. The enable password should be an enable secret password. No username and password combination has been configured. Console connections cannot be configured to require users to provide passwords. Refer to the exhibit. The network administrator has run the following command on R1. What is the result of running this command? Traffic for network 192.168.2.0 is forwarded to 172.16.1.2. This route is automatically propagated throughout the entire network. Traffic for all networks is forwarded to 172.16.1.2. The command invokes a dynamic routing protocol for 192.168.2.0. Refer to the exhibit. What does the state "FULL/ -" indicate? The DR/BDR election is currently taking place. The router with router ID 10.112.0.34 and RouterA are on a point-to-point network. RouterA could not form a neighbor relationship with the router with router ID 10.112.0.34. 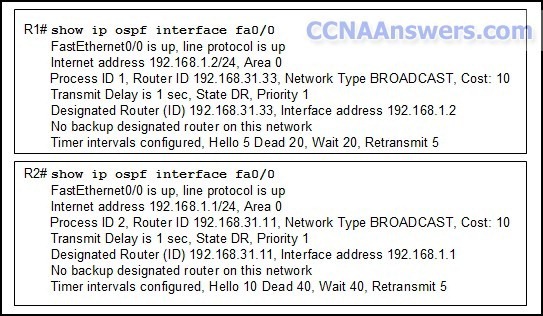 OSPF hello and dead timers between RouterA and the router with router ID 10.112.0.34 do not match. 6. A router has learned about a network through static and dynamic routing processes. 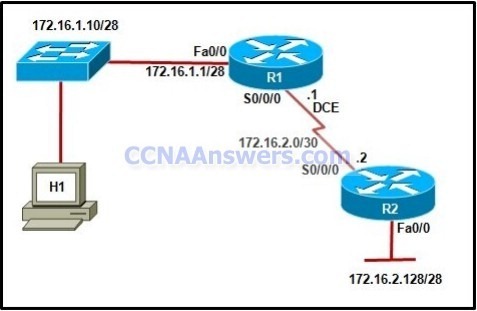 Which route will be used to reach network 192.168.168.0? 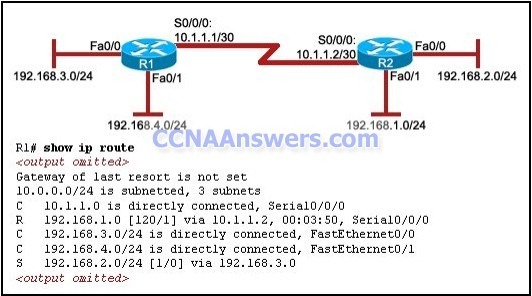 Which router interface will participate in OSPF? 8. When would the IOS image held in ROM be used to boot the router? Refer to the exhibit. On the basis of the show running-config output, which option correctly reflects the routes that will be listed in the R2 routing table? Refer to the exhibit. The hosts on the R1 LAN are unable to access the Internet. What is incorrectly configured? Refer to the exhibit. A ping from R1 to 10.1.1.2 is successful, but a ping from R1 to 192.168.2.0 fails. What is the cause of this problem? 12. 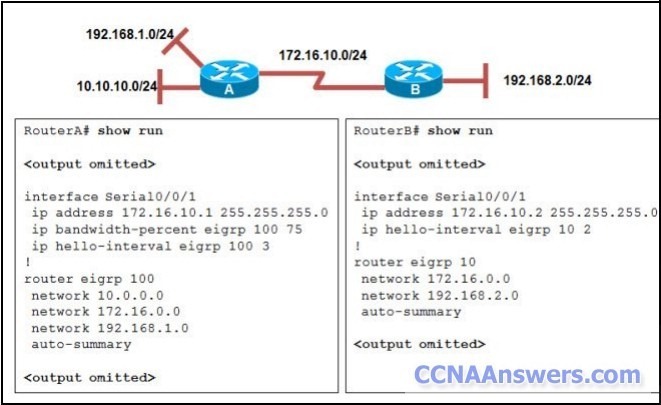 What is a characteristic of classful routing? The router modifies the TTL field, decrementing it by one. The router changes the source IP to the IP of the exit interface. The router maintains the same source and destination IP. The router changes the source physical address to the physical address of the exit interface. 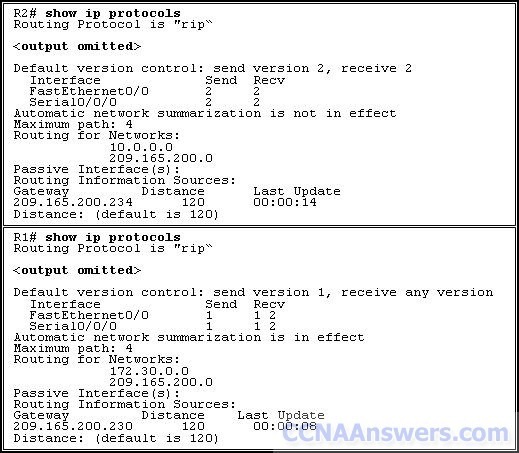 The router changes the destination IP to the IP of the exit interface. The router sends the packet out all other interfaces, besides the one it entered the router on. 14. 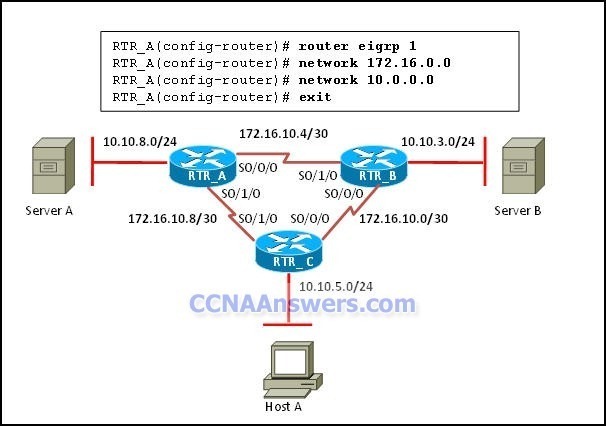 Which routing protocol maintains a topology table separate from the routing table? Refer to the exhibit. The 10.4.0.0 network fails. 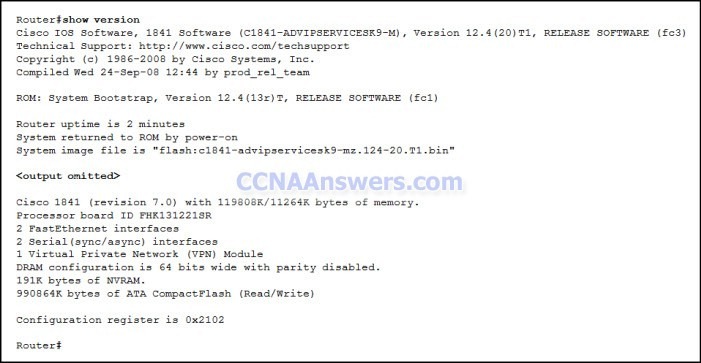 What mechanism prevents R2 from receiving false update information regarding the 10.4.0.0 network? 17. Which multicast address does EIGRP use to send hello and updates packets? Refer to the exhibit. The network consists of hundreds of routers branched from connected regional distribution sites using single area OSPF. Recent network failures caused packet flooding and route recalculations in all branch networks. What should the engineer do to minimize the effect of the routing instabilities? Adopt RIPv2 which is not subject to packet flooding. Implement a mix of routing protocols to contain the instabilities. 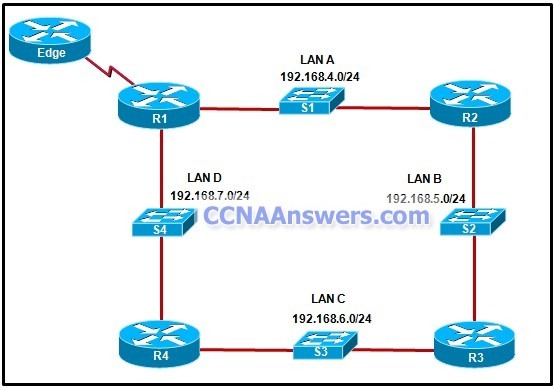 Change the topology to a heirarchical design which puts each branch network in its own area. 19. A network administrator is using an application that is monitoring packets on the network and sees an EIGRP update packet. What is the purpose of the update packet? The packet is sent to discover neighbors within the EIGRP network. The packet is sent to search for network devices within an EIGRP network. The packet is used to propagate routing information within the EIGRP network. The packet is used to send an unreachable reply to another router within the EIGRP network. The packet is used to notify all routers that EIRGP has failed on one of the routers within the EIGRP network. 20. A router boots and enters setup mode. What is the reason for this? 22. 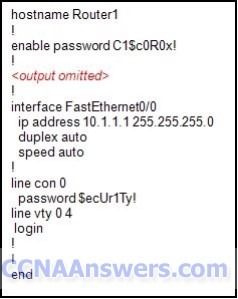 Which prompt is used to allow a user to change the IP address of an interface on a router? Refer to the exhibit. 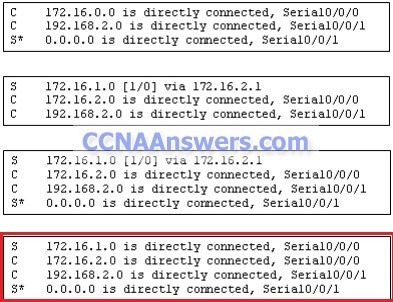 Which path will traffic from the 172.16.1.0/24 network take to get to the 10.0.0.0/24 network? It will send the traffic via ABC, and will use ADC as a backup path only when ABC fails. 24. Which statement correctly describes a feature of RIP? RIP is a link-state routing protocol. RIP uses only one metric—hop count— for path selection. Advertised routes with hop counts greater than 10 are unreachable. Messages are broadcast every 10 seconds. Refer to the exhibit. R1 and R2 are both configured with RIPv1. Beginning from global configuration mode, what comand or commands will eliminate RIP updates on the Ethernet segment of R2? 26. In a complex lab test environment, a router has discovered four paths to 192.168.1.0/24 via the use of the RIP routing process. Which route will be installed in the routing table after the discovery of all four paths? Only the DR and BDR have a router ID. A loopback interface is required to configure the router ID. The router ID is used to uniquely identify each router in the OSPF routing domain. Any interface, even one not participating in the OSPF routing process, can be used to determine the router ID. If no loopback interfaces are configured, the router chooses the highest active IP address of any of its physical interfaces. RIPv2 does not have a hop count limit. EIGRP supports discontiguous network designs. RIPv2 does not support discontiguous network designs. Refer to the exhibit. Which IP address and subnet mask can be configured on host H1 if it is to communicate with the network? Refer to the exhibit. What will happen when the router reloads? It will boot into ROMMON mode. It will ignore the start-up configuration file. It will look for the start-up configuration file on the TFTP server. It will attempt to load the start-up configuration file that is stored in NVRAM. 31. You have been asked to explain converged networks to a trainee. How would you accurately describe a converged network? A network is converged when all routers have formed an adjacency. A network is converged immediately after a topology change has occurred. A network is converged when all routers flush the unreachable networks from their routing tables. A network is converged after all routers share the same information, calculate best paths, and update their routing tables. 32. A router needs an IOS upgrade. Which component must be checked to make sure it meets the requirement for the new IOS? Refer to the exhibit. What information can be determined from the displayed output? EIGRP packets are waiting to be sent to the neighbors. The adjacencies between the routers are yet to be established. The IP address 192.168.10.10 is configured at serial interface S0/0/1 of router R2. Router R2 is receiving hello packets from a neighbor with the IP address 192.168.10.10 via the R2 S0/0/1 interface. 34. Which default EIGRP configuration must be modified to allow an EIGRP router to advertise subnets that are configured with VLSM? 35. Which protocol is used by EIGRP to deliver and receive update packets? Refer to the exhibit. 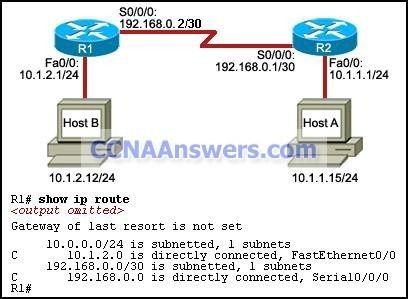 Which option will provide the configuration that is needed for router R1 to dynamically learn routes to the 192.168.100.16/28, 192.168.100.32/28, and 192.168.100.48/28 subnetworks? 37. A network administrator is setting up a new router with a device name of Admin, an encrypted password of cangetin, and the IP address 192.168.1.22/29 assigned to the first FastEthernet interface. Which command sequence correctly configures this router? 38. All routers in a network are configured in a single OSPF area with the same priority value. No loopback interface has been set on any of the routers. Which secondary value will the routers use to determine the router ID? The highest MAC address among the active interfaces of the network will be used. There will be no router ID until a loopback interface is configured. The highest IP address among the active FastEthernet interfaces that are running OSPF will be used. The highest IP address among the active interfaces will be used. 39. What is the purpose of the TTL field within an IP packet header? Refer to the exhibit. Host A is unable to access the Internet. What is the reason for this? The IP address of host A is incorrect. The Fa0/1 interfaces of the two routers are configured for different subnets. The subnet mask for the Fa0/0 interface of R1 is incorrect. Refer to the exhibit. R1 and R2 are adjacent routers both running RIP. All interfaces on both routers are correctly configured and operational. Both routers are configured to include all connected interfaces in routing updates. R2 is not showing any routes from R1 in the routing table. What is the likely cause? The adjacent interfaces are passive. The distance of 120 exceeds 15 hops. R2 will not accept version 1 updates from R1. Routes are being summarized by R1 but not by R2. Refer to the exhibit. Router R2 is configured properly and all interfaces are functional. Router R1 has been installed recently. Host A is unable to ping host B. Which procedure can resolve this problem? Configure a static route on R1 using the IP address of the serial interface on R1. Configure a default route on R1 with the exit interface Fa0/0 on R1. Configure a static route on R1 using the IP address of S0/0/0 on R2. 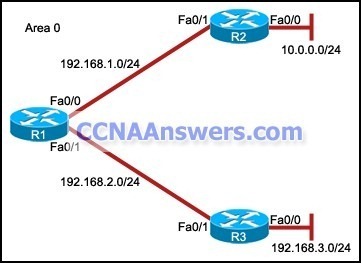 Configure a default route on R1 using the IP address of Fa0/0 on R2. Refer to the exhibit. All routers are configured to use the EIGRP routing protocol with default settings, all routes are advertised on all routers, and the network is fully converged. Which path will the data take to travel between 172.16.1.0/24 and 192.168.100.0/24? It will travel via A, B, and C.
It will travel via A, F, E, D, and C.
It will travel via A, G, H, and C.
The traffic will be load-balanced on all paths. Refer to the exhibit. A technician has configured the interfaces on the Router, but upon inspection discovers that interface FastEthernet0/1 is not functioning. Which action will most likely correct the problem with FastEthernet0/1? A clock rate should be added to the interface configuration. The subnet mask should be added to the interface configuration. An interface description needs to be added to the interface configuration. The no shutdown command needs to be added to the interface configuration. Refer to the exhibit. Host A is having problems accessing server A. All routers have the same EIGRP configuration as router RTR_A. What should be done so that host A can access server A? Add the command no auto-summary on all routers. Change the network statements to include a wildcard mask. Adjust the EIGRP hello timers to account for the network delay. Add the command eigrp log-neighbor-changes on all routers. Refer to the exhibit. Routers R1 and R2 are directly connected through a FastEthernet link but cannot form a neighbor adjacency. What could resolve the problem? The cost on R1 should be set higher. The priority on R1 should be set higher. The OSPF process ID numbers must match. A backup designated router needs to be added to the network. The hello and dead timers must be configured with the same values on both routers. Refer to the exhibit. Which summarization should R1 use to advertise its networks to R2? A static route will be updated in the routing table. The traffic from the Internet will be directed to R2. The traffic from the source network 172.16.0.0/22 will be blocked. The route will be specified as the default route for all networks not defined in the routing table. All the broadcasts will be forwarded via the S0/0/0 interface of R2. 50. What is the function of the OSPF LSU packet? Refer to the exhibit. The interfaces of all routers are configured for OSPF area 0. R3 can ping R1, but the two routers are unable to establish a neighbor adjacency. What should the network administrator do to troubleshoot this problem? Check if the interfaces of the routers are enabled. Check the hello and dead intervals between the routers. Check the process ID of both routers. Check if CDP is enabled on all the routers. Since 2012. Powered by Blogger.